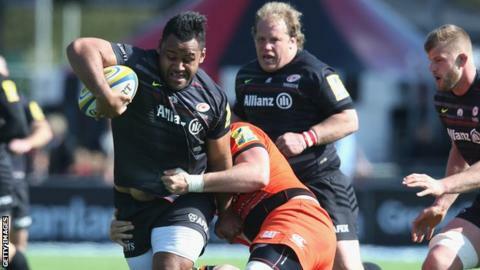 Saracens increased their chances of a top-two finish with victory over Premiership play-off rivals Leicester Tigers at Allianz Park. Freddie Burns kicked Leicester into a 6-0 lead but they lost Tom Youngs to the sin-bin and trailed at half-time after Billy Vunipola's converted try. Sarries centre Marcelo Bosch crossed immediately after the restart and Chris Wyles scored their third try. Charlie Hodgson added a penalty as Vereniki Goneva was sin-binned late on. Saracens move up to second in the table while Leicester remain fourth - although Tigers will be displaced if Exeter beat Northampton on Sunday. Burns gave Tigers a six-point lead after 11 minutes and Sarries missed two opportunities to reply through penalties. Midway through the first period Tigers were caught offside 30 metres out but Bosch saw his kick stall in the wind and, following a high tackle, Alex Goode hit the post with his effort from inside the 22 four minutes before half-time. Tigers had control of possession, and the game, for most of first half but lacked creativity in attack, using the boot to put pressure on the home side. However the visitors were found wanting in their defensive work at end of the first half after Youngs was shown a yellow card for obstruction. Following a succession of scrum penalties Vunipola powered over the line and Hodgson converted for a 7-6 lead at the break. Sarries made a blistering start to the second half, as Bosch went over in the first minute following the re-start and Hodgson added the conversion. After Youngs returned from the bin, Saracens scored their third try. The Tigers came close to an interception but the ball was spilled into the hands of Wyles, who crossed out wide. Sarries had to be strong in defence as Leicester looked for a way back into the game but Hodgson kicked a penalty for a 22-6 lead. Tigers winger Goneva came close to replying with a try but knocked on close to the line as the Saracens defence put in a committed and disciplined display. Saracens: Goode; Ashton, Bosch, Barritt, Wyles; Hodgson, Wigglesworth; M. Vunipola, George, Du Plessis, Kruis, Hargreaves (capt), Wray, Brown, B. Vunipola. Replacements: Spurling, Barrington, Johnston, Itoje, Joubert, de Kock, Taylor, Strettle. Leicester Tigers: Tait; Morris, Smith, Bai, Goneva; F. Burns, B. Youngs (capt); Ayerza, T. Youngs, Cole, De Chaves, Parling, Gibson, Salvi, Crane. Replacements: Ghiraldini, Rizzo, Mulipola, Kitchener, Pearce, Harrison, Bell, Thompstone. Sin Bin: T. Youngs (36), Goneva (78).